Happy Fourth of July! A few days ago Jack asked me when the Fourth of July was. Obviously my response was on July 4th. 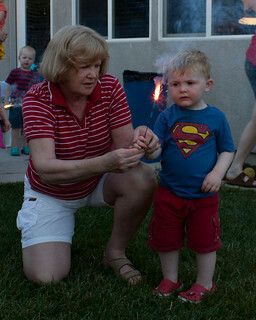 Then he asked if it was going to be on the fifth of July next year. It is interesting how their little minds work. Sparklers in Crocs probably weren’t the best idea. We spent the Fourth at my sister’s house in West Sacramento, where it was really hot. After spending most of the day inside, some of their friends came over for a BBQ. With seven kids ages six and under, two small wading pools provided the perfect way to cool off and have some fun. It is amazing how kids can take simple things, add a little imagination and play for hours. 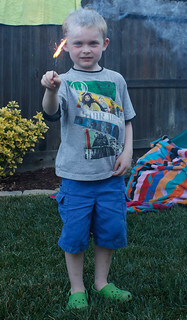 After dinner, even darkness was still hours away, Paul lit off some fireworks ( the safe and sane kind). The kids were all mesmerized. They were the kind that shoot some sparks out a few feet in the air and make some noise. Will didn’t blink the entire time and when they started to pop he did a happy dance jumping up and down. The rest of the night he kept asking Unkie Paul for more “fireicks.” We were surprised how well the fireworks showed up with it being so bright out still. Notice the sequence, first we are not sure what to do. Then excitement and the fireick dance. Watching Will’s face fill with wonder as he saw this amazing sight for the first time warmed my heart. There are certain things that turn us all into kids again and we just can’t get enough. I think fireworks are like that for a lot of people. For Jim it is the Blue Angels. They come to Seattle every year and he is like a kid in a candy store; it is like the first time he has ever seen them. What is the thing that turns you into a kid again, no matter how many times you do it?